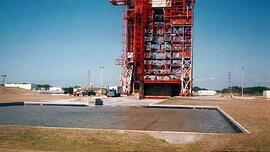 XR Geomembranes XR-5® able to withstand Florida's extreme weather at Cape Canaveral Air Force Base. Location: Cape Canaveral, FL U.S.A. The existing catch basins at the Cape Canaveral Air Force Base in Florida were constantly leaking and causing maintenance problems due to cracking of the concrete. Brown & Root Service Corporation was called upon to design a liner system which could be placed over the existing 20-year-old concrete, left UV-exposed and become virtually maintenance-free. XR-5® geomembrane, manufactured by Seaman Corporation, was the obvious choice. The holding ponds catch deluge water from Delta Missile launches, which contain liquid oxygen, hydraulic fluid and kerosene. With a filling schedule of approximately only 10 times per year, the basins are usually left empty and subject to Florida's glaring sun and extreme temperatures. The XR-5, installed by Staff Industries, was fastened to the concrete in a grid-like pattern. Its resistance to UV rays, low coefficient of thermal expansion/contraction, and high strength properties made it the perfect solution. The XR-5 geomembrane can also tolerate strong winds, a deciding factor since Cape Canaveral is located along the hurricane-prone east coast. Another design consideration was the specific gravity of XR-5 (approximately 1.3 gm/ccm), which is higher than water and therefore less susceptible to float.